Cyrus Kouandijio is getting ready for the ball to snap. 5. 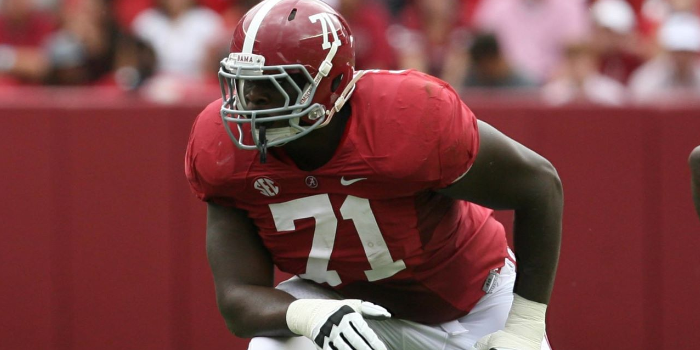 Left Tackle, Cyrus Kouandijio, looked like a big winner on the first day of the draft combine. Although he lacks the agility that he needs to remain at Left Tackle in the NFL but coming in at 6-foot-6 and 322 pounds is a good size for the NFL. Cyrus Koundijio’s long arms, aggression, and physicality will also help him tons in NFL. 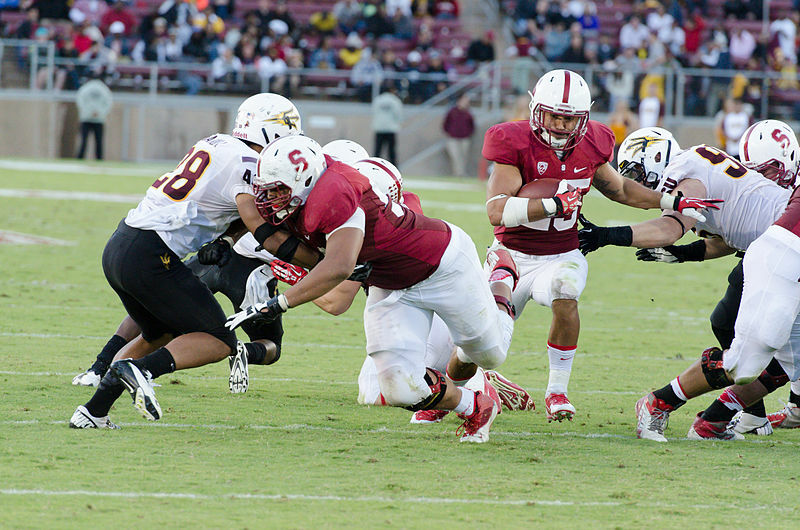 David Yankey is making a path for his running back. 4. David Yankey has had a spectacular career at guard for the Cardinals. After measuring him at 6-foot-5 and 315 pounds, I would not be surprised to see him moved outside and with more of a pass protection type of role. David Yankey looks like the type of player ready to take on the challenge as pass protection. His versatility of strengths will extremely benefit him in this role. Another fact that will increase David Yankeys value is his ability to play on both sides of the ball, left and right. Troy Niklas is running for the touchdown. 3. 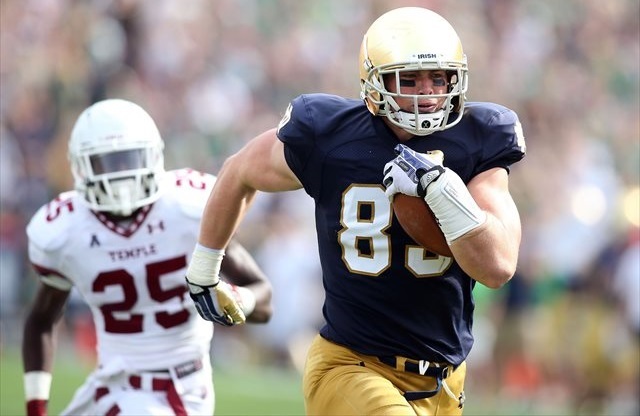 Troy Niklas is a tight end at Notre Dame. He measures in at 6-foot-6 and 270 pounds. He began his career at linebacker and a developing receiver but as he grew into the tight end role, his aggression and physicality for being a linebacker has not left him. Tight ends in the NFL are becoming very valuable to teams and are big play options all over the field. James Hurst puts off an excellent block on Clowney. 2. North Carolina’s left tackle, James Hurst, recovery is huge news to scouts everywhere. In the beginning of the year James Hurst was projected to be an early round draft pick but now he is not only rehabbing his injury but also his draft stock. James Hurst expects to be fully healthy by late March which leaves him only the pro day to go out and impress scouts. There will be no second chances for him and that could put a ton of pressure on him. Eric Ebron runs down the field while stiff arming the defender. 1. 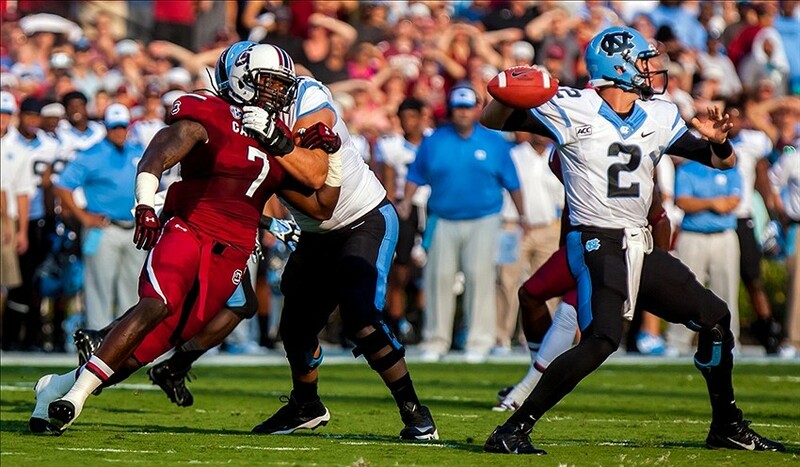 North Carolina’s tight end, Eric Ebron, came in at 6-foot-4 and 250 pounds. Eric Ebron has been focusing on his speed at the draft combine. He says he will run faster the 40 yard dash faster that 4.50 seconds, however he has not specified exactly how fast he will run it. If he is successful, than he will be the first tight end with similar size and production to run it since Vernon Davis in 2006.